Favourite Absainte initiated a double for reigning champion jockey Barry O’Neill when taking the Maddybenny five-year-old mares’ maiden at Portrush. Absainte, a daughter of Saints Des Saints, who is a half-sister to three winners including eight-time winner Sir Note, had finished second at Loughanmore two weeks earlier. Carrying the colours of the Smile Says It All Syndicate, the grey mare dug deep to fend off Questionation by a neck. Howard McIlwaine, on behalf of fellow syndicate members John Hegarty, proprietor of the Royal Court Hotel in Portrush, Wilbert George and Samuel Hanna, said: “Tony Martin [trainer] is in Leopardstown today but we have him to thank for this. 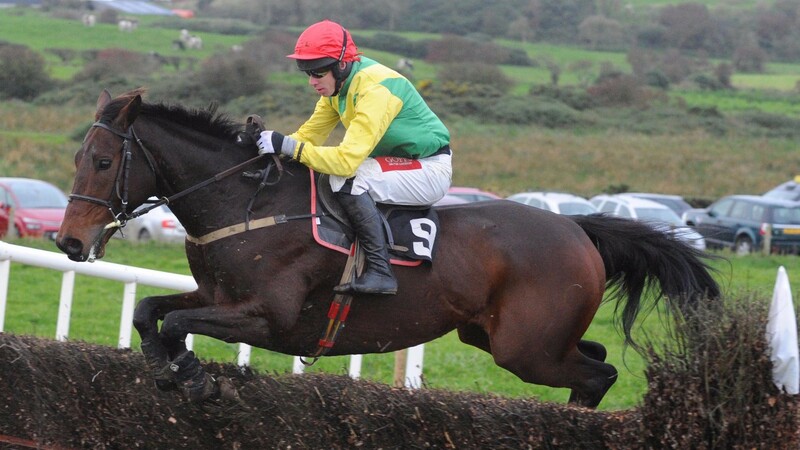 O’Neill landed his double on the Neil McKnight-trained One Cool Clarkson in the Ulster Stores winners-of-three but was handed victory by the second-last fence fall of short-priced favourite Captain CJ, who was travelling powerfully as he attempted to continue his winning streak. Second in the corresponding race a year ago, the three-time winner took advantage of this good fortune to come home six lengths clear of Celtic Thunder. “That was a great run. He doesn’t owe us anything and is a proper fun horse,” McKnight said. Mark O’Hare rode his first winner of the season on the Karen McNeilly-trained Shumaker in the Drenagh Sawmills five-year-old geldings’ maiden, combining to gain compensation for a final-fence mishap here in March. After leading from the second-last, the progressive gelding quickened clear for a 10-length victory over Some Response. “He’s tended to jump to the left and Karen Ferris has been doing some work on him. He seems to have improved, so I have her to thank for that,” said McNeilly, who enjoyed success with Benatar at Loughbrickland last November. The opening race, the Dennison Commercials LTD four-year-old maiden, produced Grade 1 winner Finian’s Oscar a year ago and went to the Gavin Cromwell-trained Weakfield this time. By the progressive Court Cave, the gelding ran an eyecatching race. The half-brother to Irish Cambridgeshire winner Sretaw made progress to challenge at the final fence, then battled on the run-in to see off Brace Yourself by three-quarters of a length. The Jim Dreaper yard, which enjoyed success in opens last season with Cavite Beta and Grand Jesture, got their opening winner of the season in the Royal Court Hotel Open with Sizing Coal, who was guided to success by Derek O’Connor. The Alan Potts-owned gelding was having his first run since March when he finished second to Roi Des Francs at Down Royal. Ridden patiently throughout, the double track winner disputed the lead at the penultimate fence and kept on gamely to see off Sabremont by a neck. “I’m delighted with that. They went a good clip in the ground and I thought he might have been a bit short of work, but he has a bit of class,” Tom Dreaper, son of the winning trainer, said. “He had a nasty fall at Aintree last year so we thought we’d come back to points as a confidence booster, and he is high enough in the ratings on the track. The Larne-based yard of Stuart Crawford also claimed its first points success of the season when Ballyhowne took the Fletcher Torrens & Semple & Sons Ltd six-year-old-and-upwards geldings’ maiden. Second on his debut at Loughanmore in 2016 before running on the track for most of last season, the Billie-Jo Irwin-owned gelding came home a one-length winner over Military Road, with the winning trainer’s brother Ben in the saddle. “It’s great to see him recording his first win as he could have picked up a few races before now,” Crawford said.